I've been in the autistic/autism blogging world for a few years now, and while there have certainly been folks at it for much longer than that, it's been more than long enough to notice this one trend: blogs mainly about autism written by non-autistic parents of autistic kids are much, much more likely to attract ridiculously large audiences than blogs mainly about autism written by actually autistic people. This trend remains largely true even for autistic bloggers who've published their own books (or contributed to books), autistic bloggers who are also parents (whether of autistic or non-autistic kids), and autistic bloggers who post fairly frequently (which I've not been doing so much for the past year or so). The purpose of this brief post isn't to rag on non-autistic parent bloggers, especially those who've been fantastic allies to the neurodiversity movement, but to discuss some of the deeper ableist reasons that autistic bloggers just can't match pace with non-autistic bloggers (parents being a main constituency, but certainly not the only category of non-autistic bloggers who write about autism). The purpose of this post is actually to talk about some of the deep-seated prejudices that result in the disparity in readership so we can start untangling and challenging them. These reasons are all related to each other, and not entirely separate, but worth talking about if allies (bloggers and readers alike) truly want to center the voices on autism that matter most -- those of actually autistic people. 1. Autistic bloggers are automatically suspect as frauds, especially if they self-identify. Because of horrifically ableist ideas that autistic people are incapable of having ideas, a sense of our own selves, or emotions -- let alone cognitive grasp of other people's perspectives as separate from ours or the ability to express ideas of our own -- autistic bloggers will be accused of lying about being autistic or otherwise being fakes. Because of the monopoly of the psychiatry/medical-industrial complex over access to a diagnosis (and therefore "legitimacy" as autistic), autistic bloggers who self-identify as autistic but who don't have a medical diagnosis are especially at risk for accusations of fraud. But even autistic bloggers who do have formal medical diagnoses are frequently accused of lying about being autistic. After all, autistic people can't write words or communicate to others since we are so self-centered and locked inside our brains. 2a. Autistic bloggers are presumed to be exceptional instead of representative of many autistic people. Even if an autistic blogger is believed about their status as autistic, they will be questioned about the applicability of their experiences, ideas, or opinions to any other autistic person. At best, their blog will be treated as an occasionally interesting foray into one autistic person's musings about their life while autistic -- in other words, treated as a personal interest story, but not a source of reliable information, theories worth thinking about, or direction for either supporting autistic people or advocating for changed policies/practices. 2b. This is closely related to the assumption that "if you can write on the internet / keep a blog / respond to these comments, you are very high-functioning and Not Like My Child. (We know of course that that's not true, since autistic bloggers have a diverse array of skills, abilities, impairments, and support needs.) And of course, if you dismiss an autistic blogger as irrelevant because of their supposed "mild" or "high-functioning" autism (things that don't actually exist), you're not going to treat their blog as a reliable or authoritative source of information or ideas about autism. 3. Autistic bloggers are thought of as writing only about their personal experiences, whereas many parent bloggers are welcomed as writing about "universal" or "shared" experiences (which also ignores other axes of privilege/oppression). Again, this is a common manifestation of oppression -- members of an oppressed group are denied collective identity or experience through a rhetoric of "individuality," while members of the relevant dominant group have their experiences privileged as universal and default. It's important to note that the most popular (non-autistic) parent bloggers also tend to be white and from middle and upper-class backgrounds, which most certainly contributes to continued erasure of autistic people of color and no/low-income autistic people. 4. Non-autistic "experts" have presumptive authority to speak about autism and autistic people, while actually autistic people have to "prove" they are even able to speak about themselves as individuals, let alone our group as a whole. For this one, oppression plays out with the assumption that members of the dominant group are treated as automatic experts/authorities with "objective" opinions while members of the oppressed group are considered incapable of having opinions or ideas that are "objective" and therefore valid to people beyond their group. In other words, people assume that things like having the letters PhD after your name, being a special ed teacher, working as a therapist or clinician, or researching autism at a university automatically make your opinion "objective" and authoritative -- and therefore worth listening to. At the same time, people assume that being autistic means you are automatically "too close" to the issue, and thus personally biased, to have an "objective" opinion -- and therefore that everything you say should constantly be doubted and questioned, even if it's about your own personal experiences. 5. Autistic bloggers are believed not to exist. It's the only possible explanation for so much of the hateful, dehumanizing rhetoric about autistic people all over the internet. (Actually, it isn't, but it's what I tell myself so as to not be completely pessimistic.) Autistic people are believed not to be reading articles about autism, and certainly not to be blogging about it. If you believe that autistic people cannot express ideas, you won't assume that any autistic people are actually writing about being autistic anywhere. You won't search for those blogs, and you won't find them. On the other hand, you will think to search for scientific research on autism, blogs by (presumed non-autistic) parents of autistic children, and advocacy organizations for autism (also presumably run by non-autistic people). And there you go. 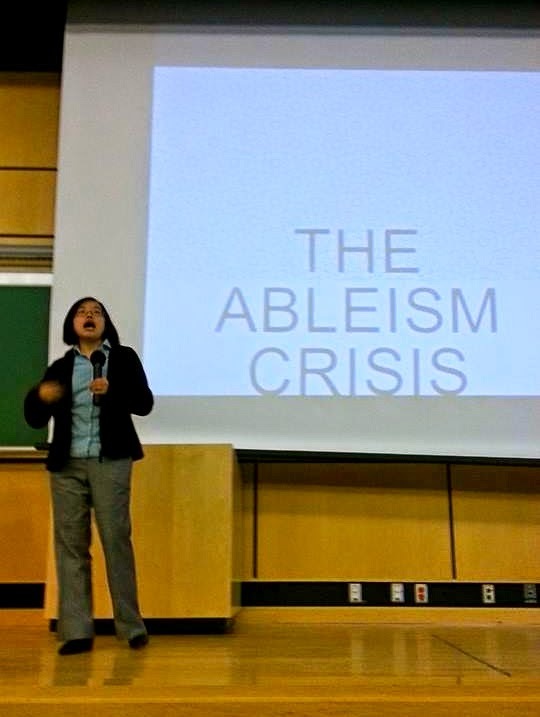 Five ableist reasons autistic bloggers lag behind in audience numbers, stability, and growth. An ongoing source of frustration throughout the autistic blogging community, and one whose numbers are even more sharply divided -- most of the prominent blogs by actually autistic people are still by white autistics, with only a handful of exceptions. We're here, we're writing, and we'd like to think we're not doing this as idle, futile exercises with no one around to care or keep reading. Keep at it :) - signed, your One...today. "(Actually, it isn't, but it's what I tell myself so as to not be completely pessimistic.)" No, I think you're right. Most non-autistic people writing about autism are doing so under the core assumption that autistic people are not reading/hearing/responding. That if they are, they're only the "very high-functioning" who aren't really the people whose issues are being discussed. You just wouldn't write about a group of people the way autistic people are written about if you were writing with an acute awareness that those very people are reading what you say. This also plays out in how we still see autism talked about as if it's *such a mystery! * When the only way for it to be a mystery is to have not read work by or listened to autistic people about our experiences very much at all. You are correct. I am one of the many non-autistic parent of autistic child and I recently(like 5 days ago) started my own public community page because I was feeling alone and needed to have an outlet. The majority of people I follow are the same, but not all. I do make an effort to support all disabilities/abilities and follow people who are bloggers, vloggers with Autism. Of any kind. It never occurred to me until reading this to question the validity of their claim. I just wanted to support their efforts as I would hope other people would is my son was able to do his own socializing online. I think bringing this issue up is important. The more Autistic perspectives from Autistic people we have, the more we will grow and understand. P.S. - I you have a chance, check out AJ'S minute on YouTube and Twitter. He is 13 and Autistic and talks about things that are interesting to him. I try to support him because how cool is he! No other reason necessary! Thanks! Some very good points, specially 2b in my experience at least. I do not agree with your view on self-identifying, I think there is a surge in non-autistic people claiming the "status" (I've heard a lot of "I'm partially autistic" in online blogs, I'll look for some links to add) in order to be appear to be insiders to readers. This isn't only appropriation, it also further marginalizes autistic writers. BTW, I am very aware that access to medical/psychiatric services remains inaccessible for a large segment of neurodivergent people, particularly those in communities already marginalized (low income people, people of color, the undocumented, etc). My comment wasn't meant to draw focus away from that, my intent was to illustrate some of the problems with not recognizing appropriation when it happens in the autistic community. I really, really think the rate of non-autistic people falsely claiming to be autistic is overblown. Autism is still very, very stigmatized and self-diagnosis is still very, very stigmatized. A tiny number of people might be able to gain status in relatively small communities, but generally speaking, there's not much in the way of status or recognition to be gained from falsely identifying as autistic, compared to the negative consequences whether people believe you or not. Also, particularly with younger people, it's possible that they're simply wrong, not trying to appropriate an identity, and that's not actually a sin. Those people are unlikely to be neurotypical anyway if they suspect they might be autistic so strongly. I have a brain injury. My first psychiatrist said I was autistic. Based on what I could recall of my life at that point, I believed him. I cared. A whole lot. Like I usually do. But... You can imagine what I felt when I started to remember. That was... torturous. Part of how I identified wasn't actually me. The last thing I want to do is appropriate. So, now I have to deal with, in a metaphorical sense, my body rejecting a transplanted dominant arm. And I want to help. My word, how do I know I'm helping and not being discriminatory in some way shape or form? I tried to validate your idea about younger people. Hopefully, I didn't take away from what you said. De Chao, have you heard of the concept of cousinhood? There's a concept in the autistic community that used to be more prevalent than it is now, of "autistics and cousins," where "cousins" are people who have a lot of similar experiences and issues to autistic people, for a variety of different reasons. Sometimes brain injury, sometimes CP, sometimes synesthesia, sometimes other developmental disabilities. And the point was to embrace people as having similar experiences and needs, regardless of what their technical diagnosis might be. If you identify a lot with the experiences of autistic people, but you're not sure whether you are or whether you have similar issues for a different reason, maybe you're a cousin! Often long waiting lists for adults to be diagnosed. People who arn't a good fit for autistic stereotypes for reasons such as "too social", "too extrovert", "not that interested in routine", "too imaginative", even "too old" can find themselves dissuaded from seeking an assessment for autism. I couldn't tell you about the waitlist for an adult diagnosis where I live, but I've definitely been told that unless I wanted one for *personal* reasons there wasn't a point in trying for a *formal* diagnosis. Thank you from this non-autistic parent of an autistic child. I am grateful for self advocates demanding to be treated as equals, as humans. My child deserves no less than full equality and acceptance within society. You have helped me see what I would have otherwise been blind to -- the double standard of the Autism Industry of professionals who claim to want to help my child while simultaneously keeping him in the category of "other". Keep up the good fight. Of course I'm not suggesting that autistic writers should only ever wrote about autism or that we should write about autism at all. This post is specifically about blogs that ARE about autism, or that more or less focus on autism as a main topic. I believe all of these reasons, BUT I think there may be another reason that isn't directly related to ableism. I find in my experience that parents in general want to read blogs by other parents... so parents of children with autism want to read about other parents experiencing whatever it is parents of kids with autism experience... and they're not so much interested in what an adult without children has to say. For me, that is probably one of the biggest reasons I think people don't read my blog. I do have readers who specifically seem to tune in to any posts that I write about my childhood experiences, because they are trying to relate to what their own children are going through. But their kids are young and I'm an adult, so mostly parents just don't even come across my blog, because they specifically want to read about other parents. Does that make sense? The blogs I've read by parents who are on the spectrum and also have kids on the spectrum seem to have many more readers than I do! I think this is true, too. Parenting culture privileges parent perspectives. I agree with you. I have a son with autism and although I value the perspective of those with autism we tend to try to find people who can relate to us, the parent. We want someone who will understand what our daily lives are like, see if they have tips that we can use in our own home, etc... My husband and I both also have autism but it is hard to translate what we went through as children into ways to always help our son. We are much more able to understand where he is coming from and why/how things affect him but we do learn a lot from parents also raising kids on the spectrum. I relate the most to blogs from parents with autism who are raising kids with autism because that is our life as well. Parents tend to follow blogs about other parents because they can relate to them. Adults on the spectrum are probably more likely to follow other adults on the spectrum if they can relate to their experiences and what they are blogging about, I know that I do. So if your on the spectrum blogging about autism your probably going to have the biggest following of individuals with autism and not so much from their parents but this goes for all blogs. "Because of the monopoly of the psychiatry/medical-industrial complex over access to a diagnosis (and therefore "legitimacy" as autistic), autistic bloggers who self-identify as autistic but who don't have a medical diagnosis are especially at risk for accusations of fraud. " Um, yeah. Autistic isn't a label being created to describe themselves, it's a label created by the "psychiatry/medical-industrial complex", so they are the ones who can tell who the label applies to. I don't know if someone who self-identifies is "like me", because I didn't self-identify, I was labeled by the complex. Not the same process. So yeah, I'm skeptical too. This is especially problematic when combined with number two, as I certainly do not want someone who might not even be autistic to speak for me as an autistic person, that's the crap A$ does. If someone actually is diagnosed, it's the same people applying the label, so the same group, and thus they can speak as someone in that group, which covers the 2b. The article would be good, but that one sentence just defeats the point. On a side note with 3, generally minorities are stereotyped based on the representation of an individual, while the majority is seen as individuals, not the other way around. The only reason 3 is a thing is because of 1/2/5, limiting autistic parents fill the role of the minority as autistic people are seen as not-even a minority. It really all boils down to 5. Thank you for sharing the very real challenges for Autistic people in having their voices heard amongst a sea of allistic voices. Even when these voices are supportive and friendly, they are not Austistic. Thank you also for acknowledging the very real impacts of intersectionality. I have certainly observed a lack of signal-boosting from privileged (white, male) content creators and sharers. Very thought-provoking, relevant, and eye-opening. Demonstrates perfectly how only (neurotypical) parents and allies, not autistics, are believed to have ideas that are relevant to the autistic community, with the exception of a famous few autistics. Indeed, I have also seen neurotypical socialites on campuses across the country be seen as true advocates when they simply slap the term "autism awareness" to self-promotion with little or no tangible impact on the autistic communities there, while grass roots autistic advocacy goes ignored. Thank you, and we must continue to blog, expecting we will be dismissed by the ableist standards we are fighting, but keep blogging, among other things, so the truth of our work will hit the neurotypical world in a way they cannot ignore. I'll just say that if not for the blog posts of other autistic women (and one certain unnamed professional who I tend to find to be more on the ball than some others), I never would have found a way to talk with my mom about a lot of the stuff I deal with. Since professionals have only recently started looking at autism in women in any way except "Why don't women seem to get autism?" the professionally sourced relevant information has been sorely lacking. If not for individual blogs by autistic women, I'd probably think myself half crazy. Very interesting ... ironically, with the blogging I've done (not a lot, actually, just a bit to support, yes, a book I had published) - I fall into the "Parents with Autistic Children" because I'm afraid to publicly self-identify. But then I lose credibility in the autism community because if I'm not autistic I can't possibly know what I'm talking about ... (and if I am autistic, I can't possibly have written a book!). Social categories are a frustrating thing! I think point 5; the not believing that we are there blogging, is actually a lot of it. Based on my experiences interacting with people in person, people really don't know what is out there for autistic people speaking out about autism. They only know about the other messages. They don't know about the possibility of looking for autistic people talking about autism. Sometimes, just telling them that there is that, is enough that they start looking, start reading, and saying they need to look more (I know more than one teacher who are searching out blogs about autism by autistic people now!) Other people it takes more for them to question what they are used to. But many it takes that initial message. Perhaps the people following parent blogs are more interested in the topics on parent blogs than autistic people's blogs. It makes sense what another commenter said that parents want to read what other parents wrote about their children and their experiences parenting their children. Amen. Every "inspirational" blog post I read boils down to "my son has a debilitating condition, but I love him anyway," with the parent hailed as brave and heroic. Of course, there's nothing heroic about actually LIVING with the condition. And if you are successful, it must be because you are high-functioning and so we can ignore your opinion. And Autism Speaks with their freaking "missing piece" logo -- because people with autism are lacking in full human capacity -- campaigns like crazy for a cure. Meanwhile, there are no resources for adults with autism. Support groups are minimal and under-funded, run purely by people without autism. All the books out there are written by people without autism for parents of children with autism. And God help you if you're a guy with autism and can't figure out dating to save your life! You still get the same platitudes the single people get, but with the added disadvantage of knowing just exactly how far behind everyone else you are. I remember how old I was when I first noticed people talking to me with a strange lilt in their voice. It wasn't until after being diagnosed at 20 that I realized they'd been talking to me the same way they talked to children and peers with mental disabilities. Yes I have found this too. Recently I was doing my dissertation on "narratives in autism blogs" (meaning blogs about autism written by autistic people). I didn't include my own blog because I was solely focused on other autistic bloggers' personal experiences, not my own. Anyway it took me quite a while via Google search to find any relevant links to autistic bloggers' blogs and not those by parents / family / professionals. I was initially going to avoid anything to do with AutismSpeaks but then realised that good research does take other opinions into account. Anyway I actually found a blog written by an autistic woman through an AutismSpeaks webpage, which I guess proves that sometimes you can find helpful blogs in what seem to be the most unlikely places. Saying that though, I did notice in my analysis of the blog that the overall tone of the post I was looking at seemed to be "what's wrong with me and how can I be fixed?" which is in line with the AutismSpeaks attitude of finding a cure for autism (which I don't agree with), so maybe that's why AutismSpeaks included a link to that blog on their website. Anyway it was interesting to observe this.